The Luxurious Living gift basket comes in an elegant and very functional black leatherette container that can be used in the bathroom to hold towels, in the den for file folders or in the living room to hold throws or magazines. Talk about an upscale pamper yourself basket, this one is the ultimate! It starts with a best selling bath set called Tuscan Honey, with a luscious fragrance that shot up to best seller soon after it was introduced. 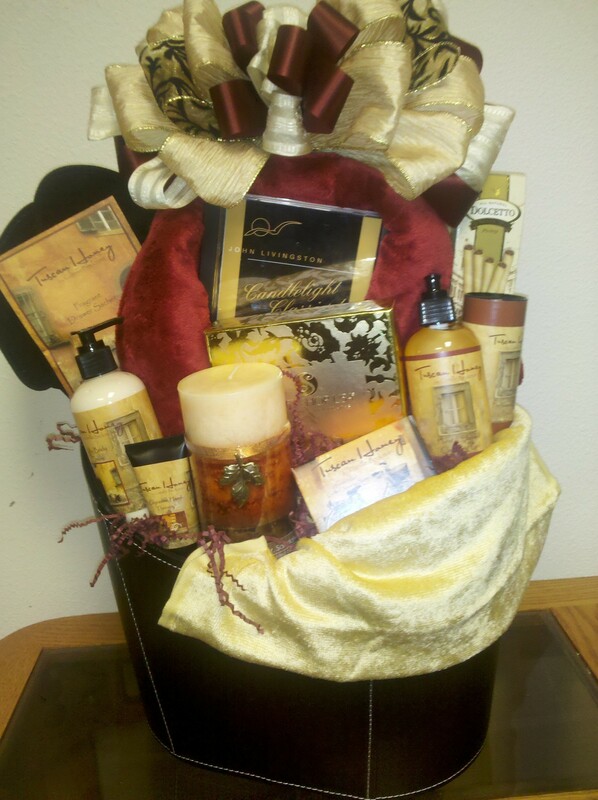 There are gifts to delight all the senses in this gorgeous gift basket! Draped over the container is a plush gold hand towel. The gift also includes a luxurious, super soft and comfy robe in a rich burgundy color, bedroom slippers, fine hand made chocolate truffles in a gold gift box, caramel peach tea, a beautiful scented candle, Tuscan Honey hand cream, body lotion, bath gel, talc powder, glyceryn soap, drawer sachets, gourmet cookies and a Candlelight Classics CD. Pamper Baskets are available in different price ranges. Our Deluxe Luxurious Living as pictured is $250.00 and is a perfect gift basket to thrill someone very special for Thank you, a birthday, or Holiday gift.